The Story: A worker-ant is determined to win the love of the next queen, even if it means shattering the rigid caste system of his colony. Unfortunately, she’s engaged to a hard-charging army-ant with a genocidal agenda. How it Came to be Underrated: This movie went head-to-head with a very similar movie, Pixar’s A Bug’s Life. At the time, critics preferred this one, but since Dreamworks' subsequent CGI output has been weak, and Pixar has become a masterpiece-making-machine, there’s a tendency to assume that, in retrospect, the critics must have been wrong. They weren’t. Not only does this one have superior animation, but the story is about a thousand times stronger --in both the comedy and the drama. Anthropomorphism is very tricky. 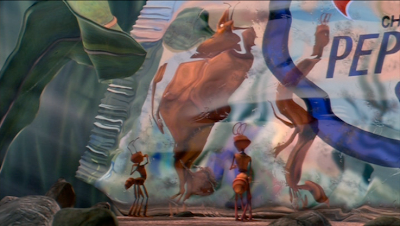 You have to be willing to abandon certain realities (letting the ants stand up right, for instance) but if you discard too many real-world details, the setting becomes pointless (see: A Bug’s Life). The filmmakers never stop finding ways to integrate actual details of the ant world that cleverly contrast with human behavior. The more detailed and believable the world is, the stronger the metaphor becomes. Both Allen and Stone are great actors whose subtleties tend to get overshadowed by their physical presence, albeit for very different reasons. It’s nice to hear them each get a chance to do some pure character work. Jane Curtain and Dan Akroyd also stand out as Chip and Muffy, the wasp-y wasps. What happens when you combine elements of Ayn Rand’s libertarian novel Anthem with Sergei Eisenstein’s Soviet film Potemkin? You’d think the world would explode, right? 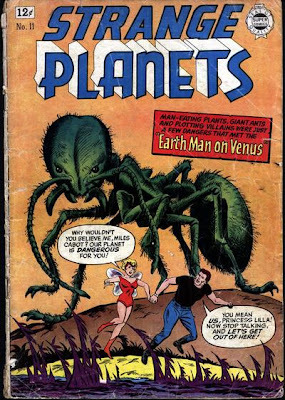 Instead you get Antz. Amazingly, it all works. If the characters talked about juggling these ideologies, we’d laugh them out of the theater, but the movie instead creates an elegant allegory that shows us how these apparently conflicting value systems might be reconcilable. It’s a beautifully structured, wildly ambitious story. 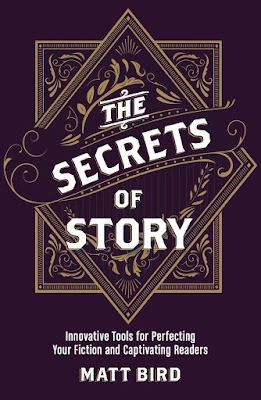 Writer Todd Alcott now has a fun, smart blog. He’s always interesting, but I don’t always agree with everything he has to say. He did a post recently dismissing political readings of the movie. Really? Have you seen your movie? If You Like This, You Should Also Check Out: The primary model for this movie seems to have been Fritz Lang’s silent sci-fi fable Metropolis. (Interestingly, that movie was written by a proto-fascist and directed by an occasional-socialist.) They would make a great double feature. How Available Is It? : There’s a dvd with a lively directors’ commentary. Today's Post Was Brought To You By: Why Wouldn't You Believe Me, Miles Cabot? Wow. 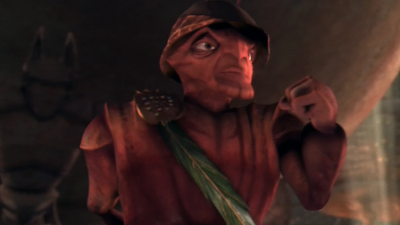 Antz isn't bad at all, but anyone saying that the ANIMATION is superior to A Bug's Life has crossed the line from an error of opinion to an error of fact. Funny thing. 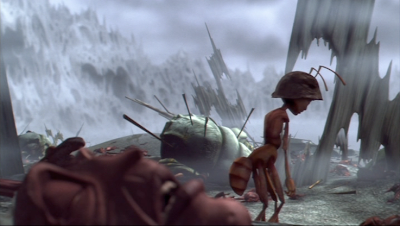 We just finished A Bug's Life last night -- more age-appropriate for our daughter and still a well-above-average kids film. While it's a lot of fun, I do always note how derivative the plot is -- but which movie is given the honor of originating its plot? The Magnificent Seven is the most obvious, but that in turn is derived from The Seven Samurai. On the other hand, there was another earlier parody of The Magnificent Seven -- The Three Amigos which matches A Bug's Life pretty much plot point for plot point. 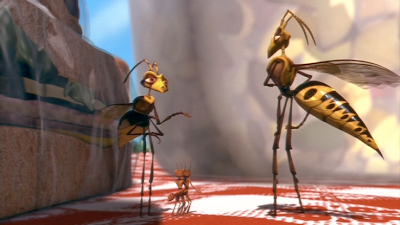 I'd like to point out the character design is much more apealling in A Bug's Life. After reading this it's obvious I haven't given a Antz a fair shake. It's on my list.